I've talked before about how much I hate drinking water and how I'm addicted to soda. In my quest to present alternatives to both diet cola and boring old water, I've had the opportunity to try out some interesting soft beverages that are safe and tasty for both kids and adults. 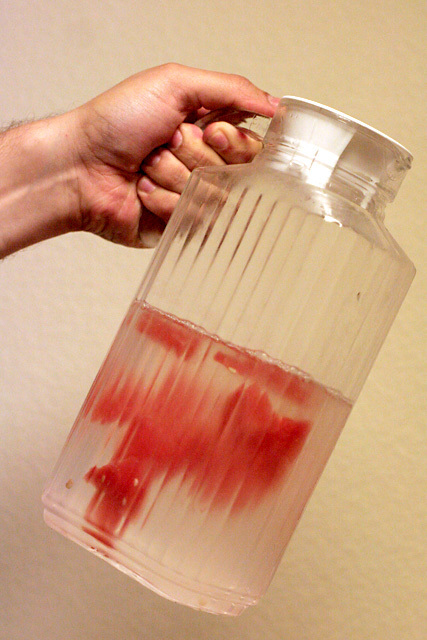 I'm sure you know the standard way to flavor a pitcher or glass with a lemon or lime, but Aphie of Botticelli Babe clued me in that almost any fruit can flavor water by saying she and her mother love strawberry water, made by slicing a couple strawberries and placing them in a pitcher. We had some watermelon slices this summer that Mikko had started eating and not finished (a common occurrence), so I sliced off the bits where his mouth had touched and cut up the rest into long, thin slices. The result was a refreshing, lightly flavored water. The watermelon flavor is not overwhelming, but it's definitely there. It's kind of like one of those fancy, expensive flavored bottled waters, or like a really watered down agua fresca. This is so incredibly easy to make. Here are some ideas for what you could add to the water, and feel free to experiment with combinations. I would slice any of the fruits or veggies you add for the strongest flavor. I don't know how many calories some fruit sweetening adds to water, if that's a concern for you, but I would guess it's negligible. Speaking of agua fresca reminded me it rocks. I usually only order it at Mexican restaurants, but of course it's possible to make at home. Hooray! Agua fresca at its simplest is a sweet mix of pureed fruit, water, and sugar. It's usually made with whatever fruit is in season and is especially yummy (to me) made with cantaloupe or watermelon. Agua fresca is strained but still has some delightful pulpiness reflecting the fruit that's creating it. There are some easy recipes at MexGrocer (which will also tell you how to make horchata), and you can find plenty more recipes with an online search. Agua fresca has more calories and sugar than the other drinks, although you can adjust the sweetness to your preference. If you're serving it to children, you should consider it akin to sweetened juice in terms of how much to offer each day. Sweet iced tea is a staple in hot U.S. climates, so it will take a place of pride on our list. It's easy to make iced tea. If you want a full pitcher, simply brew 2 cups of tea that's twice as strong as usual (about half a pitcher), and then add cold water and ice to fill the pitcher the rest of the way. Remember, if you want to sweeten the tea to add any sweetener while the tea is hot so it will dissolve thoroughly. Some ideas are sugar (go figure), honey (my favorite), maple syrup, or stevia leaves. However, any sweetener you add will also add calories and, well, sweetener, so if you're trying to cut down on sweeteners, give iced tea a try straight. If you have a very flavorful tea (some fruit teas, for instance, are quite intense), you might find you don't need as much or any added sweetening for taste. As a shortcut, there are also cool brew iced teas that allow you to skip boiling the water if you can't stand heating your kitchen in the slightest. I have really good news, too: I have a giveaway right now of the Libre tea glass, which will allow you to take iced tea (or hot tea) with you on the go! It works with loose-leaf or bagged tea but is designed for us loose-leaf aficionados. It has a filter at the top where you can keep your loose-leaf tea leaves and then just add hot water, for instant (or close enough!) tea on the go. 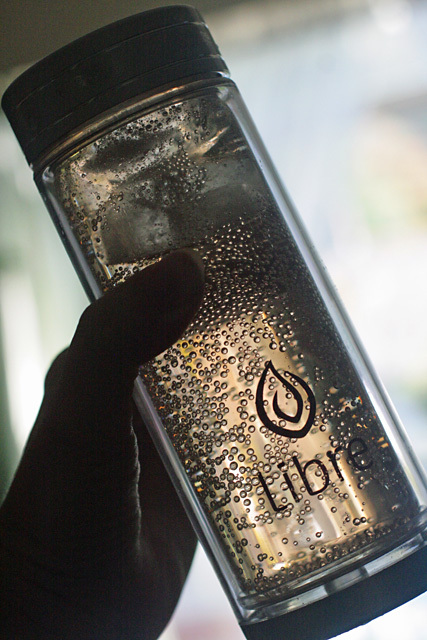 The easy way to make iced tea with the Libre tea glass is to put a full amount of tea leaves into the filter top, and then add just half the amount of hot water. Wait for steam to escape, and then add the screw top. Steep upside down. 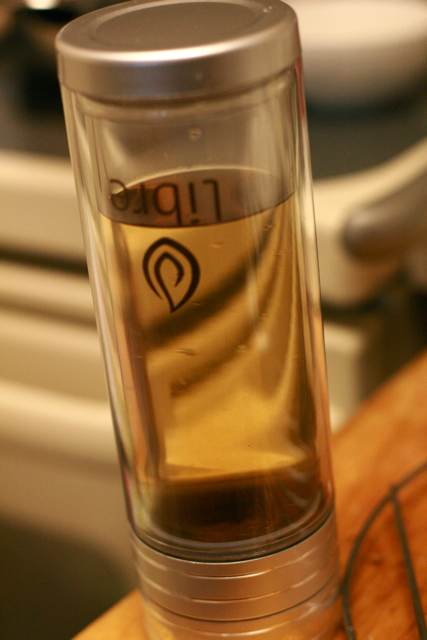 When the tea is ready, turn the Libre glass back over, and remove the screw top and filter. You can set the tea leaves and filter aside for a later rebrewing. Add any sweetener you desire to the hot brew and stir. Finally, add cold water and ice (mostly ice) to fill the cup. It might be cool enough to drink right away, but otherwise you can pop it into a handy fridge (such as at the office) to drink later. I've also found that rebrewing the leaves works really well for iced tea. You can also prepare your iced tea in advance and keep it in the fridge at home so it's ready for you to grab and take with you when you leave the house. The glass'n poly model is double-walled so that it has insulating properties to help keep your cool tea cool longer (and your hot tea hot). 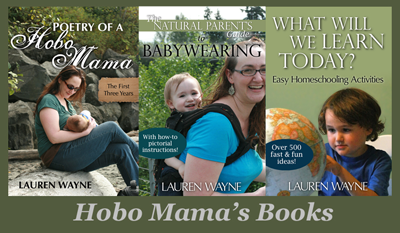 Enter the giveaway to win your own Libre tea glass'n poly by commenting over at Hobo Mama Reviews. All you have to do is tell me how you'd use this lovely glass! The contest is open to both U.S. and Canadian addresses and closes Aug. 12. Especially in the summer, a smoothie can be cooling and filling. For picky eater (kid or adult! ), a smoothie, too, can be a good way to insert some nutrition in a palate-friendly form, since it's like drinking a yummy shake. Smoothies are a perfect idea for breakfast if kids' stomachs are slow to wake up. You can make fruit smoothies in a blender from fresh or frozen fruit and just ice, and that's a vegan option. We like to add some whole-milk yogurt (such as YoBaby) or whole milk. This adds some protein and (good) fat to the mix. Fruits that are delicious to use include peaches, bananas, avocado, mango, and any type of berries. Some fruits, such as pineapple, taste good but will add some extra chewiness to the mixture (since you're not straining out any of the pulp as with juice), so be aware if you have kids with sensory preferences. Berries will usually add seeds, which also might or might not be tolerated. If you want a particular flavor without the texture, you can use a juice form instead, or add it in with the extras. For instance, we like how a peach yogurt imparts a peach flavor into the mix. Green smoothies can include veggies, such as leafy greens like kale or arugula. As an easy tip, aim for 50 percent vegetables and 50 percent fruit plus a banana or avocado. Here's a simple recipe to get you started. With smoothies, though, you can treat the combinations as an experiment. Taste as you go, and add more or less of the ingredients you have on hand. Pomegranate zing syrup ready to use! "Old-Fashioned Soda Delights: Cool 'em down with homemade soft drinks." It's a collection of easy homemade syrups based on tea or fruit juices that you can then mix with seltzer for a refreshing, sparkly drink. We've tried the Pomegranate Zing, and it's very tasty. ready to take on the go! get store brand for even cheaper. At our store, we can buy it only in the can in 12-packs. Be careful you don't buy club soda or something else that has more ingredients; check the label. It truly should read just "carbonated water." Then you can pick up a frozen concentrate of your favorite juice and store it in the refrigerator to thaw. Just pour a bit of the syrupy juice in with the seltzer in a glass, and gently stir. Add ice. Yum! Seltzer drinks have a few drawbacks. One is that you're still creating waste through the use of cans or bottles. Adding sugary juice adds, well, sugar, and calories, although you can adjust the sweetness level to suit you. I actually won a SodaStream soda maker from Krystal's Kitsch, and I'm so giddy, goofy excited, because I'll be able to make my own seltzer with less waste and my own sodas with fewer objectionable ingredients. I haven't gotten it yet (sigh), but I'll let you know how it works when I do. I'm sure I'll have some fun new drinks to add to this list! What are your favorite summer drinks? Any more water or cola alternatives to suggest for me to try? 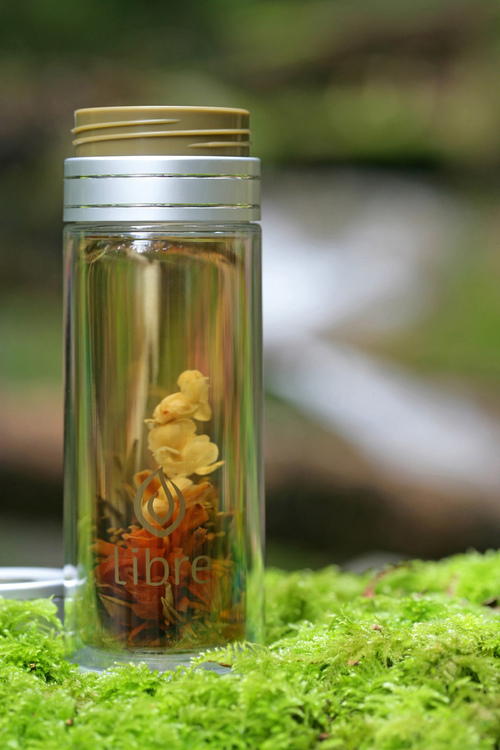 Remember to enter the Libre tea giveaway for your very own portable tea glass! You can use it for any of the drinks featured here to take on the go. I also have a giveaway up for a cool $50 at Amy Adele for personalized stationery. Both end a week from now on August 12. Linked up at Vegetarian Foodie Fridays at Breastfeeding Moms Unite! I don't know if this was mentioned in the Mothering article, but one suggestion for the seltzer/juice combo: use LIME flavored seltzer and a cranberry blend (cran-raspberry is my favorite). I usually add a splash of lime juice too and drink it from a wine or cocktail glass to make it feel extra special. Oo, nice! I like the pre-flavored seltzer idea. And putting it in a wine glass is priceless. I did add a dashing garnish of lime to mine, as in the top picture, because the Mothering article told me to. I am nothing if not obedient. Lauren, these are great idea! I'm going to have to look in my Mothering edition for the homemade sodas. Yum! I love the seltzer water mixed with juice. It's so yummy!! Thanks for all the ideas! I've been living on (filtered) water with a splash of lemon juice for months now.. so refreshing in the summer, and such a good alternative to soda! I love iced tea, but I prefer mine without sweeteners; I use a flavored black tea like Constant Comment or Good Earth (original). I put a couple of bags in a quart jar, fill the jar with hot water, and a few hours later it's cool tea, ready to be iced! I should also say that I like my tea very strong; I leave the bags in until I'm ready to drink it, but it would be easy enough to take them out earlier. It would also be easy enough to use loose-leaf tea in a ball. I also like making sun tea - they make jugs for the purpose, which are easy to find. Fill the jug with cool water, plop your tea in (I use about 4 bags, or the equivalent thereof), and leave in the sun for several hours. Um, works best if you actually have some sun. Oh, also, Katie: You would like the Libre tea glass, then, because the other way to brew tea with it is to put it inside the glass, under the filter, and then just drink through the filter. So the tea's steeping the whole time you're drinking, and that way you can have it be as super strong as you like. Kombucha or Kefir water. Fizzy, fruity drink loaded with probiotics. Who could ask for more! We love suntea, smoothies(great in popsicle molds), raw milk, and just plain old ice water. Thanks for some other great ideas. 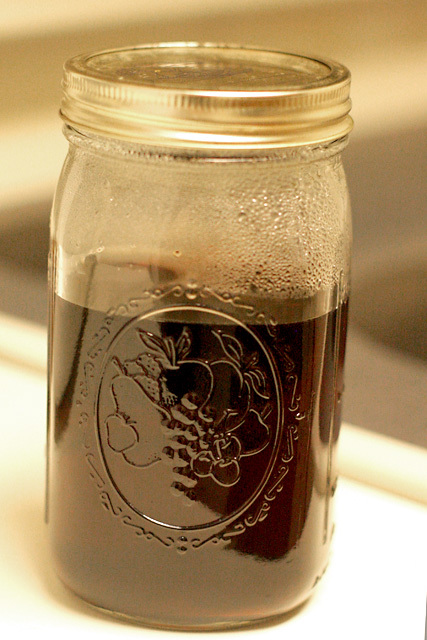 The homemade syrup look like lots of fun, might have to try it. i have been on a green smoothie kick lately. i, too, am addicted to soda but i try to fill myself up with lots of water and iced tea so that i don't reach for the bad stuff. i am breastfeeding to i want to make sure i am eating pretty well. I was hoping the Mothering article would get mentioned! I made both the Pomegranate Zing and the Lime Boost. They were really good mixed together! I love drinking plain old water, but sometimes it is nice to have a lightly flavored cool drink! Thanks for these great tips! My kids will never drink plain water and I worry about keeping them hydrated. This is a fantastic addition to my carnival. Thank you! We love just plain old water around here, but once in awhile I'll make something special. I love your idea for adding fruit or veggies to the water. Will definitely give that a try! * Dionna recommends grape stevia, which I need to try to find! Iced coffee, lemonade, margaritas. * Sally offered ginger vodka & club soda over ice with lime and a cucumber slice. Fancy & yum! * Erin said Sweet Arnold Palmers, which is half and half sweet tea and lemonade. Sangria, which I need to try making. Iced chai. Lemonade mixes. All very interesting stuff! * MamaPearDesigns says Arnold Palmer with crushed ice! Makes me wish I had an ice machine, because I think crushed ice would make even water more interesting. 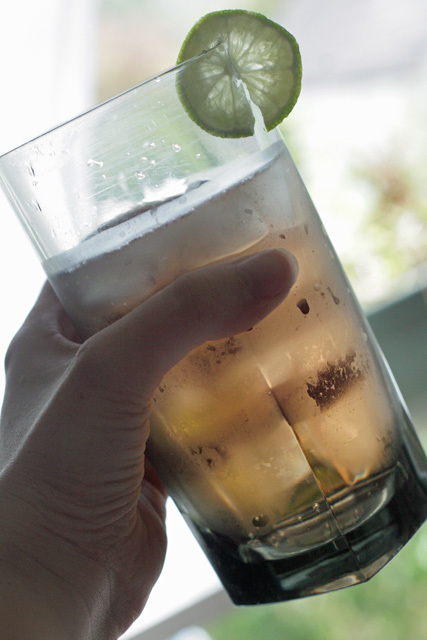 * goodgoogs suggests ginger beer and red grapefruit juice with mineral water, which is inventive. * cassiethedoula would like frozen strawberry margaritas if she weren't pregnant, so right now it's frozen lemonade. I need to freeze things more! * crunchymamato2 made sun tea out of mango black tea from Trader Joe's. * smola04 agrees with me on the mojitos angle, as well as the beer suggestion. * Rachel suggested kefir, which I have yet to try. * Megan likes kombucha, which makes me think I have to give it another go. * Maegan says iced green tea/iced hibiscus tea, both of which sound delicious. There were some repeats in there, too. For instance, Jorje, among others, actually likes water! I'm glad someone does. There were recommendations to keep it extra cold. Mallory: I want to try mixing them, too! Sounds wonderful. PurpleDancingDahlias: I really should remember to freeze our own popsicles sometime! And I forgot about milk, though that's a staple around here as well. I'm slowly trying to justify the cost of raw. The real L.A. love story: I admire you for being aware of your nutrition while breastfeeding. I need to get back some of that conscience. I was "good" when Mikko was smaller and nursing exclusively, and now I cut corners. This cutting back on soda thing is one of the ways I'm trying to recover the old ways!